Perhaps Pam Ferderbar knows a thing or two about feng shui, or at least about good fortune. Ferderbar moved to Delafield at age 12 with her parents, Tom and Helen Ferderbar, where she grew up working in the family’s photography business. 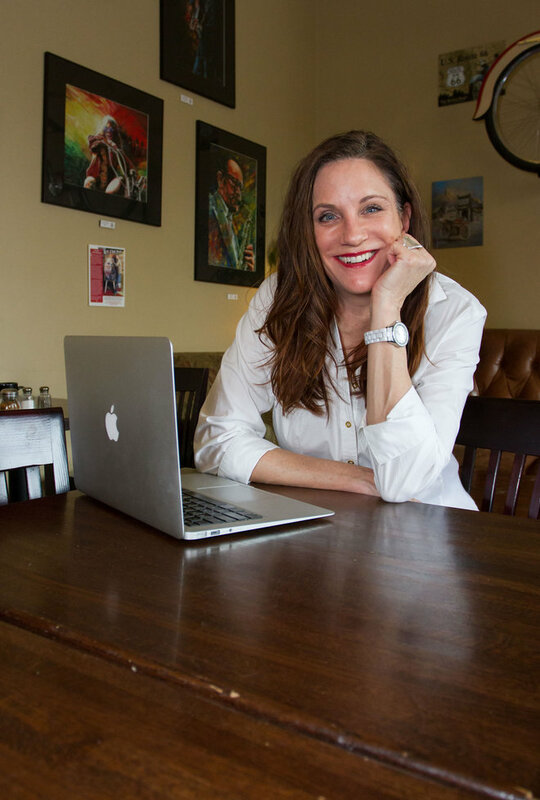 After graduating from Marquette University with a degree in journalism, she returned to the family business before deciding in 1994 to try her luck in Los Angeles. After directing television commercials for clients such as Microsoft, Wells Fargo Bank and ITT, she tried her hand at writing. A short story she wrote sparked a bidding war for the movie rights, which included interest from an internationally known singer/actress, and her debut novel “Feng Shui and Charlotte Nightingale” was born. We caught up with Ferderbar to talk about her journey as a novelist. “After writing “Feng Shui and Charlotte Nightingale” as a full length novel I returned to Wisconsin in 2013. My dad Tom, a student of the great Ansel Adams and a master photographer himself, has been tutoring me in the art of photography for which I seem to have a knack. I write, take photographs, and occasionally rescue stray dogs,” she said. Tell us about your career leading up to the book. I started in the family advertising photography business- Ferderbar Studios, as a child. I stared out cleaning the studio, then I learned to make prints, answered the phones, became a sales rep and eventually started a film division where we made TV commercials, and I became a film director. In addition to producing spots for Northwestern Mutual Life, Oscar-Mayer, Wisconsin Tourism and countless other clients, we also produced the majority of the national TV commercials for Bush/Quayle ’88 and ’92. In 1994 I moved to Los Angeles and signed with a bicoastal production company, and earned entry into the Director’s Guild of America. In 1998 I was admitted into the Writer’s Guild of America and I began writing screenplays and short stories. How did the idea for this story come to you and how long did it take to write? I was at an all-time low in my life. My aunt had just passed away in Milwaukee while I was living in Los Angeles and I questioned having moved so far away. I wasn’t happy in my personal life and nothing seemed to be going my way. One night there was a news story on TV about all these big corporations hiring feng shui practitioners to work with their architects and designers. I was intrigued by the idea that organizing a space — I’m really simplifying feng shui here — can effect the way people live and think and thrive. In the subsequent days I couldn’t get the idea out of my head. I woke up one morning and sat down at the computer and the character of Charlotte Nightingale perched on my shoulder and said “get writing!” Six days later I had the short story. Of course if was months of editing later that the manuscript was ready to be given out to friends and total strangers. I didn’t have an agent or manager — so no way other than literally handing it to people and asking that they pass it on to someone else if they liked it. Next thing I know Madonna wants to option it for $20,000. That means she wanted to put a hold on it until she could get a movie deal put together. I called an entertainment lawyer friend and he hooked me up with an agent and by the next morning a bidding war over the movie rights broke out. People were asking for the first five pages! 48 hours later we closed at $800,000 with New Line buying the rights. I wrote a story about a girl with the worst luck in the world, whose luck changes overnight, and my luck changed overnight. What I should really do next is write a story about a girl who can eat all the chocolate in the world and her thighs just get slimmer. I’ll let you know how that one works out! Is this the first book you’ve written, or just the first published? “Feng Shui and Charlotte Nightingale” is my first book. I read an article on Page 1 of the Milwaukee Journal Sentinel last year about a very successful Midwestern publisher — Henschel/HAUS, and I thought, hey, I’ve got a manuscript sitting in a drawer, and I think it’s a pretty good story given what New Line paid for it — why not? So I sent a query letter to Kira Henschel, she requested the first five chapters, and upon reading them decided to publish. Our lawyers hammered out the details, I got an advance and the editing process began. Now there’s the marketing and promotion and all the social media stuff. I have to say, the writing was the easy part! I’ve begun work on a sequel to Charlotte Nightingale as well as another novel called “Mo’s Indian.” I’ve written a screenplay entitled “Bob Dylan Stole My Wife,” which takes place entirely in Wisconsin, and for which I am currently raising the funds to produce and direct. I’d love to be shooting next summer. I’m organized in every aspect of my life except the writing part. I’m completely mad when I’m “in the zone.” I can write for 20 hours straight. The flip side is that when I’m not in the zone, it’s like pulling teeth to write. When I lived in LA I’d write at home — I loved sitting outside by the pool and working at my laptop. It was heaven. Even if the ideas weren’t flowing I was grateful for every single second I was out there in the sunshine under the palm trees. I’m from Wisconsin. I never took that beautiful weather for granted one minute during the 20 years I was there. Now that I’m back in Wisconsin I like to drag the laptop around — a favorite place is the Milwaukee Street Traders in Delafield. It’s homey, quiet, there’s just a really nice vibe there. Otherwise I sit in bed and write — something about PJs and the laptop go together like chocolate and red wine. I guess that’s kind of a theme, isn’t it? What was your favorite book growing up and as an adult? My favorite book growing up was “Auntie Mame” by Patrick Dennis. It was an old book even then, but I always loved that story. I realized when I got older that it was quite subversive for its time. It was really about anti-intellectualism in America, anti-Semitism, racism, small people and small ideas. Mame stood up to them all, and she did it with such style. Holds up today, that’s for sure. I’d like to be an Auntie Mame for my nieces and nephews! I have two favorite books right now — completely different types of books. “Seven Letters From Paris” by my friend Samantha Verant. It’s the most romantic, optimistic, lovely thing. True love of the fairy tale variety is possible at any age. How cool is that? My other fave is the polar opposite — “Gabriel, a Poem by Edward Hirsch.” It’s an elegy really, for his son. I have never read words put in this particular order. Just incredibly moving and stirring. People think poetry, ugh. But his writing is so lush and complete. It’s a masterwork. Were you optimistic about the book being published? Unlike my dear Charlotte, whose motto could be “if it weren’t for bad luck I’d have no luck at all,” I’m a very optimistic person. Stupidly so. I was surprised-ish that the book would be published — when the film project got shelved it left a bitter taste and I didn’t really think about Charlotte for a long time. So I was pleasantly surprised, yeah. In the back of my mind though I always knew Charlotte wasn’t dead yet. She’s just too great a character. Who are your favorite authors and genres? Corny as it sounds, F. Scott Fitzgerald is my all time favorite author. Rarely do I read something where every single sentence is luxurious. Funnily enough I found a similar thing to be true in the biography “The Kennedy Women” by Laurence Leamer. And at the top of the list — Patti Smith! “Just Kids” is so beautifully written that for a brief instant the reader knows what it feels like to have no choice in life but to be an artist. You can feel it in your blood and bones, the writing is so evocative. I wept. She’s a genius. In terms of fiction. I love Anne Tyler and Margaret Atwood for the universes they create — I get completely lost in those worlds. I reread Steinbeck’s “The Grapes of Wrath” now and again. Other than the Dust Bowl element it’s a contemporary story. Homelessness, so many of our own citizens going hungry, being beaten down, held down. I wonder if Steinbeck intended for it to be a cautionary tale. I am hoping to get the money together to make the film “Bob Dylan Stole My Wife” next summer. That’s a big one for me. I’m working on a sequel to Charlotte Nightingale, and I’m working with Henschel/HAUS on a collection of reader’s stories, photos and illustrations about their #CharlotteMoment. We all have ’em — those freaky events that make you want to grab the phone, call your best friend and say “you won’t believe the crazy stuff that just happened to me!” That crazy stuff has a name now, and it’s a hashtag-Charlotte-moment. My website will launch in early June (pamferderbar.com) and I’ll publish the best #Charlottemoments, give prizes, etc. People can submit their stories, video, audio, whatever. Also in early June we’ll do a “cover reveal” of the book along with a video trailer. When I said the writing was the easy part I was thinking about the video trailer. It’s like coming attractions for the movies, only it’s for a book.You’ll be able to find it on my Facebook page, the website, YouTube …all the social media arenas that I’m trying very hard to understand..
Where: Amazon.com and the Henschel/HAUS website.